In 1973, Mariner 10, an unmanned space probe, went on voyage to Venus and Mercury. In 2007, Marina 3, a manned, womanned and brothered probe, went on a voyage across the vast expanses of Marina Beach in Chennai. The mission was not to boldly go where no man has gone before. It was to go where lots of Chennaiites went on weekends and holidays. It was not to seek out strange new civilizations. It was to seek out sundal, milagai bajji and panneer soda, and a few other landmarks along the way. 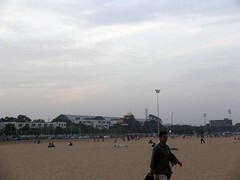 The idea was to walk from one end of Marina Beach to the other. It’s about 3 kms or so. 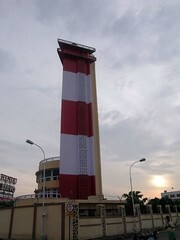 The lighthouse on Marina Beach was built in 1977. In officialspeak, it was “commissioned”, which usually means that the construction project yielded opportunities for several government employees to earn some “commissions”. While I am sure the view from the top must be breathtaking, tourists/visitors aren’t allowed upstairs. Apparently, sometime in the past, a few blokes attempted to test and measure the value of g by using themselves as the falling object. 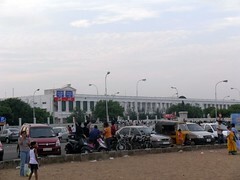 A 100 year old Colonial style building painted in spotless white, the Director General of Tamil Nadu Police’ office is right across from the Lighthouse. It is currently undergoing renovation and they are planning to construct a three-storey annexe in the sprawling open spaces behind the stately white building. Apparently, constructing concrete monstrosities in open, green spaces and blocking the sea breeze for the rest of city is the present government’s definition of “renovation”. Since we had already walked the astronomically humongous distance of 200 metres by this point, my wife demanded a snack as an incentive before we moved on. 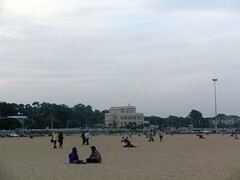 So we located one of Chennai’s landmarks, the Beach Sundal boy. These interesting characters tend to hang around the part of Marina Beach where couples hang out, hoping to catch a few moments of undisturbed intimacy before the cops start hounding them. In this matter, Chennai can be particularly annoying, as Marc points out. Anyway, the modus operandi of these kids is to strike a cunning contract with the couples – You buy 10 Rs of Sundal and I will let you have your precious privacy. At this point, the kid usually adds “he he he he”. 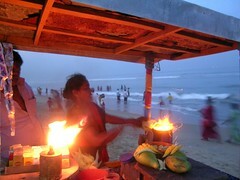 And this is why I named Marina beach as “Kadalai Sundal Beach” (in the map ). Men come here to put kadalai, but end up buying it from a pushy 10 year old salesman instead. It’s hard to miss these colourful things. The idea is to pay Rs 10 and get 5 bullets (pellets, more like it). 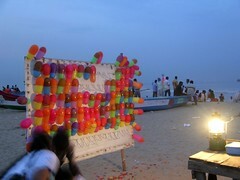 The distance from which a customer needs to shoot is quite close to the balloons. In fact, if one stretches ones arms a little bit, the tip of the barrel of the small air gun the operator hands you is likely to poke and burst the balloons before the trigger is pulled. But it’s fun to watch. See those boats in the background? A closer look at one of them told me that it was donated by the Unwind Center, in the aftermath of the 2004 Tsunami, when Marina Beach looked like this. Originally built by “The Ice King” Frederic Tudor, as part of his Frozen-water empire in 1842, this building was used to store ice imported from Boston, Massachusetts. Presumably, most of this ice became the “On the rocks” component of East India Company/Raj era drinks of Scotch. Later, the building was named Castle Kernan, after a justice of the Madras High Court. Unverified legends claim that Justice Kernan had an superhero alter-ego named Justice Erjunan, who went around dispensing justice with his bow and arrow in the narrow lanes of Parrys corner after sunset. Today the place is called Vivekaanandar Illam (House), because the Swami stayed there briefly during the 1890s. By now we had covered about a kilometer or so and my traveling companions were demanding some more activities in the snack department. While my wife and younger brother had corn on the cob, I had 4 pieces of raw Kilimookku Maanga (Thothaapari) smeared with chilli powder and salt. And some ignorant people still swear by caviar. Hmph. Chepauk Stadium and Triplicane Railway station. That large industrial warehouse type structure is the Triplicane (See Naa Mumz territory in the Chennai Map) railway station, part of Chennai’s so-called Metro project, that aims to provide train connectivity for the entire city by the next ice age. You can also see the 4 floodlights of M A Chidambaram Stadium (also called Chepauk stadium), the only cricket ground in India where mineral water bottles are used for only one purpose – drinking water. Drinking water reminds me – there are some enterprising people who dig into the beach sand till they find clear, fresh water (after all the capillary, filtering action of the beach sand) and sell it for 6 Rs a bottle. It’s pretty tasty and presumably safe, because I haven’t contracted any deadly waterborne diseases yet. It was becoming twilight and since I was not carrying an AK-47 (a digital SLR), the photos I took as the sun went down didn’t quite come out well with my cape gun (Nikon coolpix something). So the rest of this voyage will be described not with pixels, but with words. After some huffing and puffing, we reached MGR Samaadhi and the long line of small shops, hawking Milagai Bajji, Fish fry and other goodies. We tucked into some ulcer-friendly bajjis and drank Custard apple milk shake. I also noticed a few examples of modernity slowly seeping into the beach based astrology services industry . In the past, there were vast numbers of Kili josiers (Parrotastrology). In the 90s, they were replaced by some funny looking anthropomorphic pink structures called “Robot Horoscopes”, that were nothing more than hidden tape recorders playing back some generic “predictions” through a WW2 era headphone. Today, I saw a full-fledged desktop PC, running Windows 95, complete with a scanner and printer. “Computer Astrology”. Perhaps some really smart program analyzes scanned palm images and makes predictions. I don’t know. It was getting late, so I decided to leave this one for later investigation. Staying up late helped me get the first comment in. Let that be a lesson to the rest of you. The pellets used in the air gun to shoot balloons are actually just moong dal dipped in silver paint so it isn’t all that dangerous. I used to think that it was. I had 4 pieces of raw Kilimookku Maanga (Thothaapari) smeared with chilli powder and salt. And some ignorant people still swear by caviar. Hmph. I was recently in the general area with one of the guys on your blogroll – I was amazed to find the whole area full of what older citizens of Madras are pleased to call ‘nuisance’. I was remarking about this to your brother blogrollwallah when a muscular local brushed past us. He seemed to be in a hurry so I craned my neck to see where he was going. There he was just a hundred yards away from us, in flagrante delicto right at the edge of the water, contributing to the general ‘nuisance’. I think this is what prevents people from Besant Nagar walking on the beach all the way, for example, to the Theosophical Society (TS). Likewise no intrepid walker can make it from the TS to Marina. My dad’s bachelorhood was in Madras back in the days of firebrand anti Brahminism as espoused by the younger Dr.Kr. Ahh the memories! Though I’ve always been an “Elites” beach person, it was just this trimmed down. Surprised you didn’t meet any “astrology aathas” on the way. Agree with marc …the molaga bajjis deserved an honorable mention here! You lucky dogs who have a beach and all. All us land lubbers go green with envy whenever we read about beach cities. Resultantly, the moment we see Marina beach, we all run at 100kmph, completely ignoring the thenga manga pattani sundal boys et al, and jump straight into the sludge. People who live in that area tell me that all shops on the Marina have been removed except for those in one particular stretch. Wish they’d do that for Elliots. It’s a tiny beach, as it is. The mineral water bottle observation brought back memories of Eden in ’96– I cant shake off crying Kambli from this picture..help! !